I’m a fish physiologist and endocrinologist. My research over the past ten years has focused on the fascinating world of pheromones and chemical communication in fish. 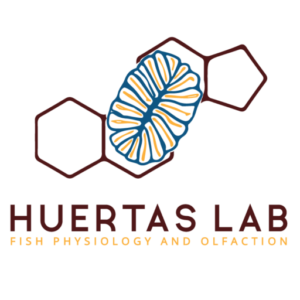 My primary area of research at Texas State centers on olfactory processes in fish. Specially, I’m working to uncover how external chemical signals (pheromones, chemical cues, pollutants) are detected by the olfactory epithelia, how that information is integrated in the brain, and how it is translated into activation of the endocrine axis that initiates a specific physiological process (reproduction, behavior, etc). To achieve my goals, I use several techniques that I’ve refined, including electrophysiology, protein biochemistry (to investigate the morphology and physiology of elements of the hypothalamus-pituitary-gland axis), histology and molecular procedures. I chose my scientific specialization with the goal of advancing understanding of the vertebrate olfactory process and providing new tools for managing of fish populations.